The Harmandir Sahib also known as Darbar Sahib (Punjabi pronunciation: [dəɾbɑɾ sɑhɪb] or Sri Harmandir Sahib, is a Golden Gurdwara Sahib of sikhs located in the city of Amritsar, Punjab, India. 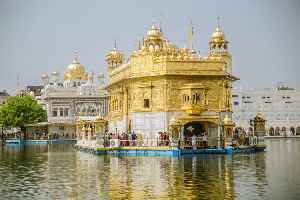 It is the holiest Gurdwara and the most important pilgrimage site of Sikhism.. It is usually called the Golden Temple in English.